I must admit I’ve watched more than my fair share of HGTV. I love home improvement shows because our houses are sacred places. They become sanctuaries where we should feel safe and secure. The colors we choose and the way we arrange the furniture can leave a home feeling healthy and harmonious or chaotic and cluttered. I believe it’s important that we create at least a small space in our homes that is peaceful and relaxing; a place where we can focus our thoughts on Sacred things. The solution (Cue the music!) is a home altar! Now, we don’t have to be interior designers to create beautiful home altars. My advice is don’t listen to any author, Christian or Pagan, who says your altar should be set up “exactly like this!” Altars are personal things. Like snowflakes, they reflect the diverse beliefs of the people who construct them. 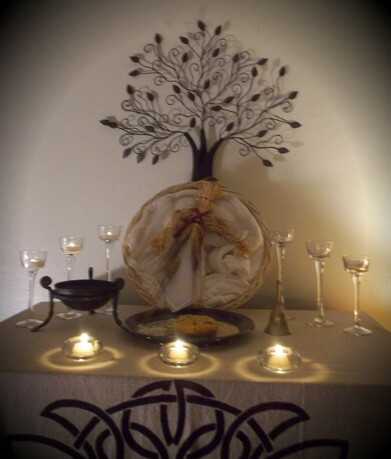 You can create an altar on top of a table or a small cabinet. Some people even have them in their bathrooms! The choice is yours. If you have kids, might want to construct yours in a place that’s out of reach from curious fingers. (Or create one that is kid-friendly so they can use it as well.) Mine is on top of a chest-high bookcase in my home office. Choose your space carefully because this is the place you will go to meditate, pray and let go of the negative energies you’ve picked up during the day. What should you put on your altar? That’s up to you.Both Christians and Pagans will want to place items on their altar that help them to connect with the Divine. Not surprisingly, mine is a hybrid altar that has a cross and several icons but also includes items representing the four elements as well. North (earth): I have rocks I’ve collected from sacred places abroad. Other choices include actual soil, salt or crystals. Whatever works for you. East (wind): Incense is always a nice choice. The scent creates an atmosphere in the room that is different from the rest of our everyday world. A bell or Tibetan singing bowl can also add an auditory element to your altar. South (fire): Candles are a must. West (water): I use either a small stoneware pitcher or a goblet, depending upon my mood. Some people even use those little plug in zen fountains. Again, the choice is yours. Whatever you decide to place on your altar, be creative. Take time to think about what is Sacred and beautiful to you. If the objects on your altar help establish a sense of the holy and make you feel happy and harmonious, then they are a good choice. Who knows, maybe someday it will be a show on HGTV. I can dream, can’t I? This entry was posted in Creation Spirituality, Prayer, Spirituality and tagged home altar, Spirituality, Wicca. Bookmark the permalink. Reblogged this on Haven International. Thanks for sharing my post. Glad you like it! Those are some sweet pictures. Are those altars in your home? They are beautiful!